ETSU baseball player Kevin Phillips is from St. Louis, Missouri, where he attended University City High School. 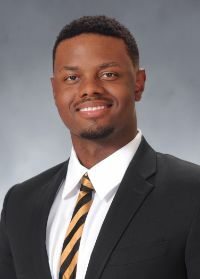 He is a senior at ETSU majoring in business. Before committing to play baseball for ETSU, Phillips was a two-sport athlete at University City High. He was mostly known for his baseball ability and can play multiple positions. He spent most his time at catcher and started every game since his freshman year in high school. As a freshman in high school, he posted a .410 batting average. Phillips was named Conference Player of the Year at University City High. Being a sure-handed catcher made the switch to first baseman easy for Phillips. As a freshman at ETSU, Phillips, like most, had to wait his time. In the 31 games he played, he started in 22 of them. In just his freshman year, he posted a batting average of .259 while still getting adjusted at the college level. He was also selected for the Atlantic Sun All-Freshmen team, as well as the all-academic team. In his sophomore year, he started 29 games, posted a .261 batting average and was in the top five on the team in on-base percentage. The improvement didn’t stop there. In his junior year, he started all 56 games and made a huge jump in his batting average. He posted a .323 batting average, putting him in top three on the team. He was in the top three in almost all statistical categories offensively and defensively. He earned College Sports Madness second team All-SoCon and SoCon Player of the Week in March and led the team in homers (10), doubles (21) and RBI’s (55). Coming into his senior year, Phillips was recognized as one of the top 50 first basemen in Division 1 baseball. So far this season, the Bucs are 1-1, and Phillips is off to a great start, batting .556. A fun fact about Phillips is that his brother was drafted by a Major League Baseball team, the Washington Nationals, in 2008.